Well to be more exact eagle is the word buzzing around the MOLA office at the moment. You may or may not have seen the news about the latest find; it’s not strictly from our beloved site, but a site a bit further east. However as it is an exceptionally impressive find, and it would have been in London at the same time as objects from our Walbrook site, we thought we would present it to you. A sculpture of an eagle fighting a serpent! – and the person who carved this was certainly talon-ted! It stands over half a meter high, and is made from limestone. When excavated from the city site it was first thought to be just a piece of masonry, a stone from a building. However one of our supervisors decided to take a closer look and after a bit of cleaning got somewhat excited. It’s not everyday you find an eagle! It certainly looked Roman, but it is known that those pesky Victorians had a penchant for creating dead wingers (!) of classical Roman or Greek sculptures. As such too much jumping and squealing was suppressed until it had been authenticated by those who know, and eventually those who know (Dr Martin Henig) gave a nod of the head and it was declared to be 1st or 2nd century AD and likely to have originated from a funerary monument. Eagles occur frequently in the Roman world, and can be found on a range of items such as statues, lamps, coins and jewellery. The British Museum has over 2000 Roman objects which display an eagle. 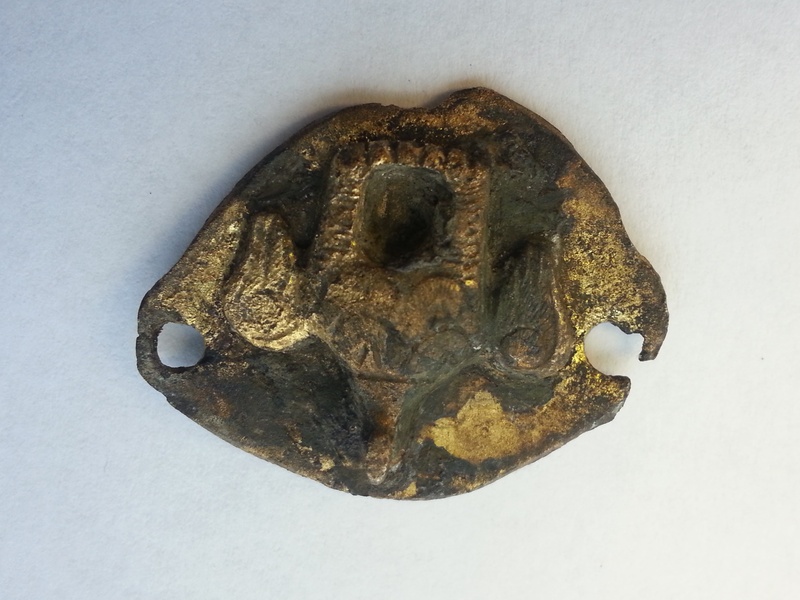 On the Walbrook sites we have found a number of objects with images of eagles, such as intaglios, coins (similar to the coin below recorded by the Portable Antiquities Scheme) seal boxes and military harness gear. Eagles have various connections with the Roman world. First and foremost it is the bird of Jupiter chief of the Roman gods and because of this it can also be a symbol of Rome itself. The eagle has military links too: an aquila (or eagle) was standard carried by each Roman legion. The infamous 9th legion is said to have lost its eagle standard somewhere in Britain when they disappeared. For a while it was argued the Silchester Eagle was part of that standard, but however it is now believed to be from a statue of a Jupiter or perhaps the emperor. The symbolism of snakes was widely associated with healing and rebirth (due to the shedding of their skin) and they served an apotropaic function; like phalluses and other good luck charms they served to ward off bad luck. The Walbrook sites have also produced snake objects in the form of jewellery, possibly also part of a pottery vessel with snake decoration, and in these contexts snakes are probably benign forces. Eagles and snakes are quite widespread in classical art. Sometimes the pairing is quite friendly but here there is a confrontation between snake and eagle though may suggest more complicated symbolism than the indivdual snakes and eagles from the Walbrook. Is the bird’s triumph over the snake meant to stress the power of Jupiter? The statue probably came from a mausoleum in the cemetery outside the city so it is possible that the snake here represents death and eagles appear elsewhere in funerary art for example as as a means by which Emperors can be carried to the heavens to join the gods. So what about our Walbrook eagles and snakes, what were they used for? What about the other depictions of gods and mythological scenes? Sometimes meanings seem quite straight forward such as a little weight in the shape of the god Mercury who you can see on our site hoarding along Walbrook as you pass by. Having the god of commerce and money on the weight might prevent either side being cheated in transactions and brink a little luck to the deal. The eagles on military equipments are probably symbols of imperial power, even when they are quite cute like the one above, while those on seal boxes could signify that they were being used to seal official packages or that they had imperial protection. Some are undoubtedly just decorated because the Romans loved fancy decorated bling and while certain images were carefully chosen the same symbol won’t always mean the same thing in different places. We continue to use the eagle as a symbol today in many different contexts. It appears on the Great Seal of the United States and an eagle and snake appears on the flag of Mexico. Media reports on the eagle can be found here. And click the link for information on the Museum of London, where the eagle will find its new perch for the next six months. Be sure to go visit it! Interesting how mythological themes are sometimes mysteriously reflected in present day creative work. I had not studied Roman eagle and snake symbols when I wrote my fictional story ‘Aquila & the serpent’ in the 1970’s. Even so, those characters appeared. You can now read the short,colour illustrated book at my website Paula Wichall Visual Art.